The English County of Herefordshire borders the counties of Worcestershire, Warwickshire, Shropshire and Gloucestershire and also Wales. The town of Ledbury is 28 miles from Cheltenham and 18 miles from Tewkesbury. A Herefordshire town and its nearby villages and attractions - Ledbury just 16 miles from Worcester following the A449 this attractive town has much for the visitor to see , with its black and white timber framed buildings it has a charm that has attracted tourists from the world over, with its many small individual shops shopping can be done at a leisurely pace. 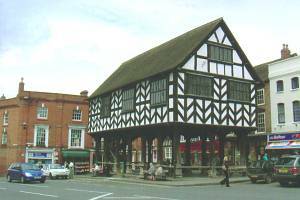 Ledbury is steeped in history ,in 1645 the Royalists fought with Oliver Cromwell's troops in the main street a battle which was won by the Royalists. A much photographed landmark in the town is the Market House, this dates back to 1653 and was erected by John Abel who was known as the �Kings Carpenter', this impressive structure is built in brick and timber and stands on sixteen massive wooden posts, originally built as a grain store the building is now used as the Town Council chamber, a twice weekly market is held here. Each July Ledbury plays hosts to a poetry festival and attracts many persons of fame in the literary world. 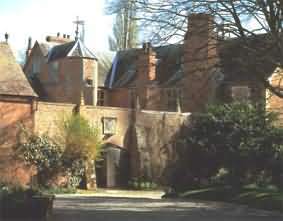 Elizabeth Barrett-Browning came to live in the area as a child and it was at Ledbury that she started to write her poetry, the town Library is a memorial to her and is known as the Barrett-Browning Institute, it is the home of a collection of books associated with John Masefield and the Dymock Poets. John Masefield was made Poet Laureate in 1930 , the son of a Ledbury solicitor John was the third of six children to Edward Masefield, his ashes are buried in Westminster Abbey's Poets Corner. 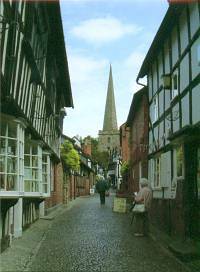 Amongst the places of interest is the Ledbury Heritage Centre here visitors can discover more about the historic town. Butcher Row House is a Folk Museum and has many objects of local history on view. The Ledbury Leisure Centre is available to non-members and can be booked on a casual basis. 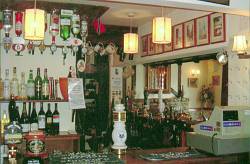 There are many Pubs, Hotels and eating places situated about the town providing plenty of choice for the visitor. The parish church �St. Michael and All Angels' is recognised as being the finest non-monastic church in Herefordshire , built in the Norman and Early English style it is worthy of a visit. Just a five miles from Ledbury on the A449 Ross on Wye road is the village of Much Marcle, this village has much to offer the visitor young and old, Westons Cider is made here and it is possible to tour the cider making plant and to make purchases of cider, taste free samples in the shop and buy other mementoes. 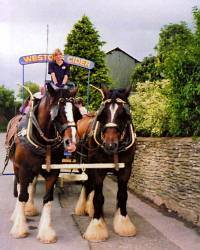 Besides this Weston's have a Rare Breed enclosure for cattle.There is the opportunity to ride on the Brewers Dray which transports passengers on a ride through the village. Nearby is the 'Slip Tavern', named after the famous Landslip which occurred in 1571, details of this are described in the entrance hall, the Slip offers fresh home cooked food , a selection of Ales and Wines are available , with its Gardens providing an outside eating area as well as the attractive Bar and Lounge the welcoming atmosphere of the �Slip' is an ideal place to "take a break" whilst on day out. The Slip is also one of the venues for the Ancient custom of Wassailing (from a anglo-saxon word Wes Hal which means - be whole) , with its Pagan origins the evening commences with a torchlight procession from the pub to a nearby orchard , a tree has been selected for the ritual of encouraging a good crop of apples in the ensuing year, fires are lit around the tree and the ritual proceeds, with the Morris Men with blackened faces leading singing and dancing around the tree, a gun is fired into the tree to "Wake it Up" , pieces of toast soaked in cider are attached to the tree with the idea of attracting birds. With all the proceedings completed everyone makes their way back to "The Slip" where hot food awaits. Each month a Folk evening is held and is a popular event. See more about - Wassailing and Morris Dancing. There are two other Pubs in Much Marcle both of whom cater with Bar Snacks and Full Menu's, these are The Walwyn Arms and the Royal Oak they are situated on the A449 and are just a short distance away. A point of interest also within the village is Hellens, this is a fortified manor house and dates back to mediaeval times, it is reputed to have a ghost and a secret passage, its fascinating history attracts many visitors and is worth a visit, opening days are restricted to Wednesdays, Thursdays, Sunday, Bank Holidays and by special arrangement. The Church is St. Bartholomew and has its origins in the 13th century, there is an ancient Yew tree , it hollow trunk can hold 10-12 people, due to its age the branches are sagging , these are supported by old gas lamp posts that were obtained from Cheltenham. Other attractions near Ledbury are Eastnor Castle standing on the A438 road, this has its origins in Georgian times , many events are held here throughout the year, the castle itself is decorated in Gothic and Italianate style. There is Children's playground, a Maze and a Garden Centre, surrounded by a Deer Park , Arboretum plus a Lake it is a pleasant attraction to the area. 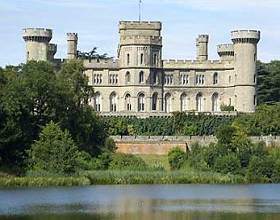 For more information see - Eastnor Castle. Coddington Vineyard is also near to Ledbury, and can be reached by the B4214 from Ledbury or the A449 being signposted from those roads, here in a beautiful setting is a vineyard that produces some 4000 bottles of wine , three varieties of grapes are grown. Once an apple orchard, the owners Dennis and Ann Savage replaced the trees in 1985 and had their first crop of grapes in 1989, on site in an outbuilding close to the 17th century farmhouse is a shop where wines and pottery can be purchased. Coddington vineyard has been described as one of the most beautiful vineyards in England. It lies below the Malvern Hills in an area of outstanding beauty. It is a small family business with a two acre vineyard and modern winery. Bacchus, one of the most widely planted grape varieties in England, excels here. This is an early ripening cross of Sylvaner, Riesling and Muller Thurgau . It is pleasantly scented, dry with good acidity with a hint of Gewurztraminer and Sauvignon Blanc.